For as long as I can remember, DreamWorks has played third fiddle to the unstoppable forces of cinematic nature that are Disney and Pixar. Though ever present and always offering up enjoyable and well received pictures like Megamind, Madagascar and the early instalments of the Shrek series, the studio sits very much in third place alongside the Toy Storys, Ups, and Frozens of the animated universe. A slight shift in power and recognition began to occur, however, with 2010 release, and subsequent 2014 sequel follow up of How To Train Your Dragon and How To Train Your Dragon 2. In these films, DreamWorks managed to rival the very best in animation and tone of its towering competitors, and How To Train Your Dragon 2 was, in my opinion, unjustly beaten to the Best Animated Feature Oscar this year by Big Hero 6. 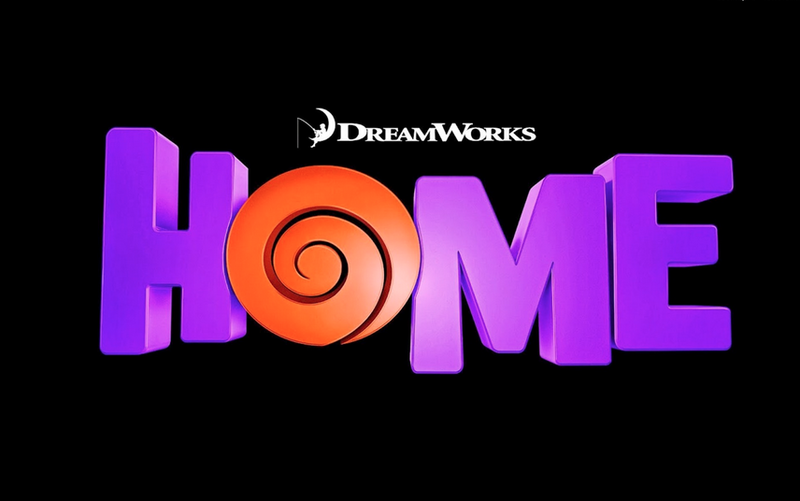 So, with its sails buoyed and confidence boosted, would DreamWorks’ latest offering Home be a continuation of this new found success or a backwards step somewhere in the direction of 2007’s Bee Movie? 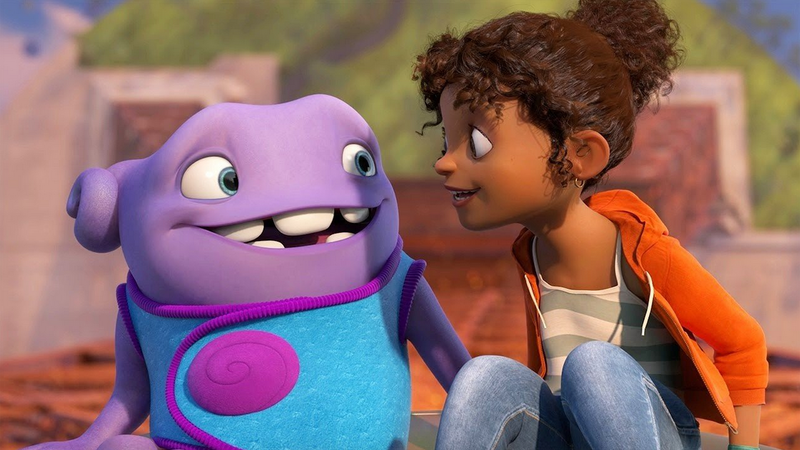 In all honesty, though there is plenty to enjoy about Home, one would have to admit that it signals a slight dip in form and momentum for the studio. The film tells the story of Oh (voiced by Jim Parsons), an alien of the Boov race who is an over friendly, accident prone outcast, different from the rest of his race in his desire for companionship and conversation. The Boov, lead by Captain Smek (Steve Martin), travel through the galaxy, invading planets one by one in their mission to escape from the ever chasing rival race the Gorg. Their time has come to invade Earth, and in doing so all humans are kidnapped and relocated to a crowded area of desert so that the Boov can occupy their homes. All, that is, except Tip Tucci (Rihanna), who escapes the process with the help of her cat and through a series of chance encounters, finds herself on a road trip with Oh to find her missing mother (voiced by Jennifer Lopez). The film proceeds as an exploration in to the culture differences and growing friendship between Oh and Tip, filled with all the usual obstacles and antagonists that one expects in a narrative of this kind. Most of the picture’s most enjoyable moments come in the humorous exchanges between the two characters, mostly silly but never patronising or over sign posted. The the overall plot may be somewhat lacking in its execution and direction, the themes of reuniting with loved ones and finding friendships in unlikely places are universal and do provide the film with a satisfying degree of heart. A couple of fantastic elements that Home must be commended for is in its featuring of an ethnic minority protagonist (so, so rare in mainstream animation) and in its decision to animate Tip’s body in a much more realistic way than other studios choose to do. Given Disney’s past history and recent criticism that their live action version of Cinderella has received for its apparent manipulation of Lily James’ waist, it was so refreshing to see a character with chubby cheeks and believably wide hips. Of Tips’ eyes are still three times the size of a real human being, but props to DreamWorks for giving kids a lead character who might actually resemble them in some way. With perhaps the exception of the How To Train Your Dragon series as mentioned above, DreamWorks pictures tend to not operate so well to a multi age audience compared to Pixar, and their overarching moral messages are not painted with as subtle brushstrokes. Though Home is undoubtedly an enjoyable animated adventure, I have my doubts as to whether it will have lasting multi generational appeal. Jim Parsons as Oh is the heart of the picture, exercising a reliable movie alien brand of ‘I don’t understand human nature’ comedy to get big laughs from misusing words and learning our culture to humorous consequence. Rihanna as Tip is a rather odd and uninspiring choice. Her native Barbados accent certainly gives authenticity to the character’s back story, but the popstar’s line delivery often falls flat and feels somewhat amateurish compared to Parsons’. Ultimately, though Oh’s antics are indeed funny for the most part and the emotional tug of Tip’s search for her mother resonates and brings the film to a warm and satisfying conclusion, I feel that Home will remain a pleasant watch for the kids but not a film that bridges the gap and becomes a favourite for the whole family. Overall, Home does not quite live up to the post How To Train Your Dragon standards that DreamWorks offerings now have to live up to. It is lively, vivid and fun in large spots but ultimately falls short of becoming a truly great animated feature. It is to be commended for its more realistic representation of human anatomy and for giving beautiful young brown skinned girls an animated heroine to relate to, but in terms of strength of story and lasting impact, I predict Home will not stay in the wider cinematic memory for long. Is it just me or does this sound exactly like Lilo and Stitch? There is definitely a Lilo & Stitch vibe to it! Though I cannot see it having the long lasting love that that has. I completely agree with your review. Home is pretty silly but it’s very sweet.